When I was little, I really loved watching ‘Land of the Giants” it was so cool a show, and then of course the ‘Honey I shrunk the Kids” movies were also a lot of fun. For some reason, when I saw these gorgeous retro pieces by The Loft @ C88 were modify, it was with excitement that I was able to resize them and play my own little setting of fun. 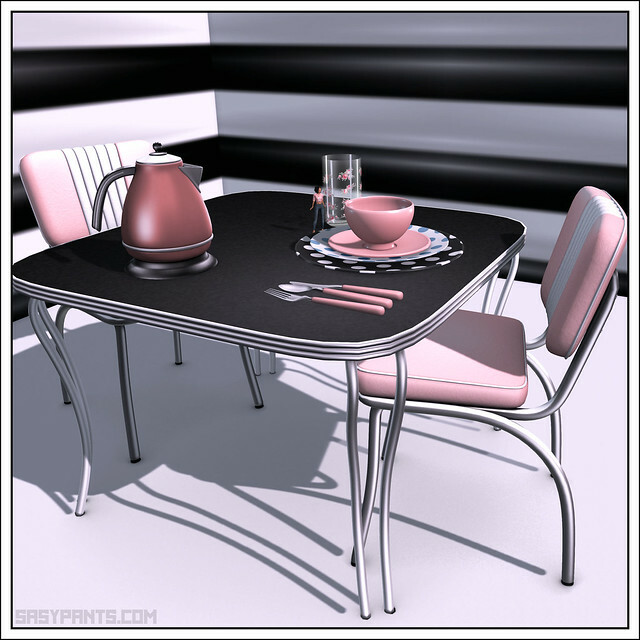 In RL I have a table and chairs similar to these, my chairs are orange and my table top is yellow, but I just could not resist the pink and black options of these sets. The texture work on these are perfect, glossy and well detailed, then of course the modeling of the mesh is up to the level you can always expect from The Loft. I really was glad that making them so big didn’t lose any of that detailing. The clothing is also part of this round of C88, the shirt has been seen all over the grid, every time I venture out someone is rocking its look…and the high waisted jeans are perfect. To finish off the look is gorgeous Cats Eye glasses by Yummy…these are perfect in shape and size, and look just perfect for any glasses wearing look you may be going for. I am starting to get such a wonderful collection of eyewear from Yummy, I cannot wait to see what Polyster has in store for us in the sunnier months ahead. The hair, so adorable and cutsie is from Ploom, and is at this edition of My Attic. It has texture change ribbons on the hud, as well as a huge array of colours to choose from. The poses are also by Ploom, and as I was going with a theme, I wore skin and Visage appliers by Plooms other brand for skins, White Rabbit.